Slash is laying waste to Rio de Janeiro in a fit of rage, searching for his palm tree. Eventually the army is able to capture the crazed alien turtle by hitting him with a giant missile. 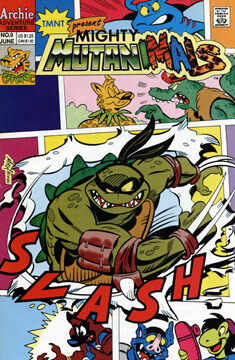 Meanwhile, the Mutanimals land on a nearby beach and Jagwar spots a newspaper that has a cover story regardng the capture of a “monster.” Jagwar states that they must free Slash as he’s being victimized for being different – the others agree that they should rescue the troubled turtle. The guys sneak onto the army base and Mondo picks the locks holding Slash prisoner. The group carries the sleeping alien out of the base, but soon thereafter Mondo steps on a twig which snaps, awakening Slash, who goes into another rage and attacks the Mutanimals. Leatherhead gets angry and pins Slash to the ground. After being subdued, Slash agrees to calm down. Ray asks him what the problem is and Slash tells the tale of how he had rescued Krang from a toxic waste dump planet with the promise of being taken to a world full of palm trees (TMNT Adventures #23-25). Ray asks why Slash has such a fascination for palm trees, and the alien explains that he grew up on a world called Palmadise, which was filled with the trees. Slash lived there in bliss and peace until an alien race arrived and cut down all of the trees and took them away. On that day, Slash swore vengeance on all authority figures… which lead him to where he is now – hunted, angry and without any palm trees. Leatherhead states that he has an idea, and so the Mutanimals take Slash to the tropical island that they had been enjoying in the previous issue. Ray tells the turtle that he can make this place his new home. Slash thanks the Mutanimals for their help. Thus the Mutanimals monthly series ended, due to faltering sales.